ምምሃረ፡ልሳነ፡ግዕዝ: 21: Verbs: The Passive Voice etc. 21.1: Most active verbs assume the passive voice when the prefix << ተ >> (ta-) is added to them. This prefix also sometimes produces a reflexive or a reciprocal meaning. The ta-prefix be added to any of the four types of verbs, making Bt, Dt, Lt and Qt. 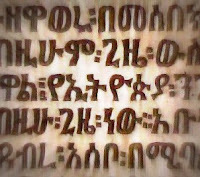 Note that oftentimes, in Bt, the medial vowel disappears, so: ሰገደ (sagada – he worshipped) becomes ተሰግደ (tasagda – he was worshipped.) Also, not every Bt, Dt, Lt and Qt form verb has a corresponding “active” form. *not Dt, but same idea. She was taught the laws. Labels: classical ethiopic, ge'ez, ge'ez passive voice, passive voice, reciprocal verbs, reflexive verbs.